It is not without an overwhelming sense of achievement and pride that we must wave farewell to Pancreatic Cancer Awareness Month. We can’t thank our supporters enough for all of their hard work and outstanding achievements this November. Thank you all so much! 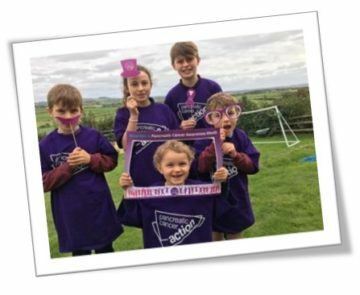 We’ve seen supporters across the country get involved with all sorts of fundraising and awareness activities for this year’s Turn it Purple campaign. From baking purple cakes and wearing purple clothes to braving the shave and completing personal challenges! A huge well done and thank you to everyone who’s gotten involved this year and helped us fundraise an astonishing amount of money for early diagnosis research. Here are just a few of the 2018 highlights! With an astonishing 1082 votes, 2018’s Turn it Purple photo competition winner was Kelly Williams and her family! We absolutely love their use of our purple props and PCA t-shirts! Thank you for representing Turn it Purple throughout the entire month of November. 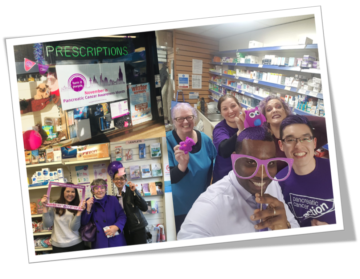 We’ve seen pharmacies from all across the country enter our Turn it Purple Pharmacy of the Year Award and their dedication to raising awareness of pancreatic cancer is absolutely outstanding! It’s been our pleasure to share their photos throughout the month and we can’t wait to announce the winner in December. To find out more about our Pharmacy of the Year Award, click here. Kelley put purple streaks in her hair, Gillian organised multiple awareness events and David sported a purple beard! 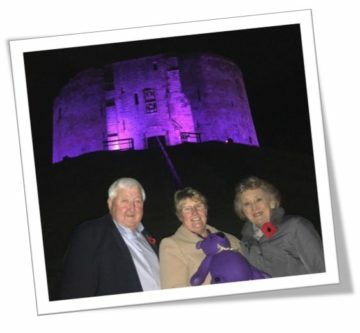 Jean Keast lit up lots of buildings purple this month, including Cliffords Tower! This year’s collaborative Purple Lights for pancreatic cancer campaign saw locations across the world lit up purple to raise awareness of pancreatic cancer. Not only is Purple Lights a fantastic opportunity to raise awareness but it’s a lovely way to remember or celebrate the life of a loved one. Thank you to everybody who lit up local landmarks and their homes this November. To see the Purple Lights gallery, click here. World Pancreatic Cancer Day took place on Thursday 15th November this year and our key focus was to raise awareness of the signs and symptoms of pancreatic cancer, along with highlighting the facts and statistics surrounding the disease. Our CEO and founder, Ali Stunt, along with our fantastic community of media volunteers, appeared on various radio stations across the country, raising the profile of pancreatic cancer and sharing their experiences. Thank you to everybody who got involved with our radio day! Click here to find out more about WPCD 2018. This year, we launched a new campaign that invites people from all walks of life to share their stories and experiences of pancreatic cancer. Not only were people able to share their stories but they were able to offer support to people who might be going through a similar situation. To find out more about the campaign and to read our People of PanCan’s stories, click here. This year, Turn it Purple has been bigger and brighter than ever before. With awareness stands, fundraising events, physical challenges and much much more happening across the country. We can’t thank our fantastic community of supporters enough! Previous Article People of PanCan, thank you all so much Next Article Take Action this Christmas!